The seven churches mentioned in the Book of Revelation are all found in Turkey: Ephesus, Smyrna, Pergamum, Thyatira, Sardis, Philadelphia and Laodicea. 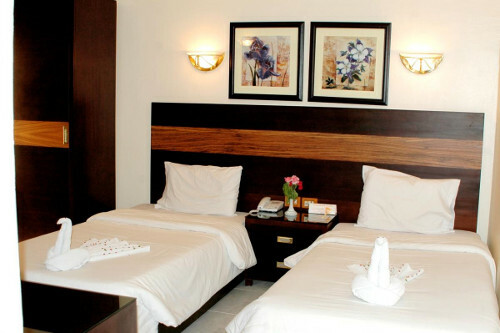 "It was a perfect organised trip from beginning till end! Pick-up from Hotel in time. Tou rguides on the rides and scenes spoke English very well and were very informative. Drop-off also in time. 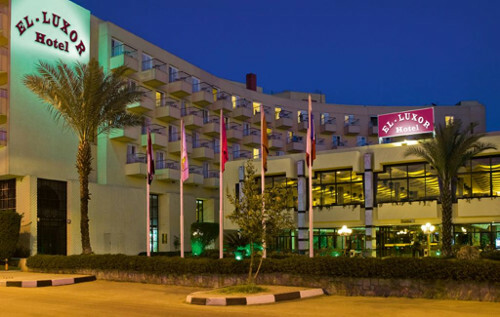 In the evening I stayed in an hotel in Canakkale very nice hotel!. This was a good decision to make because I think in Canakkale there are more bars and restaurants than on the island and this is closer to Troje so my hotel pick-up was at 11:30. Gallipoli was very impressive especially because I was ther at March 18th 2015. Troje was also very interesting because of the importance place in historical writing. I can recommend this trip to everyone!" This comprehensive budget tour takes in all the main sights in Jordan and Egypt including Petra, Jerash, the Dead Sea and Wadi Rum in Jordan, the Pyramids & Sphinx, Philae & Karnak temples, the Valley of the Kings. Welcome to Jordan! 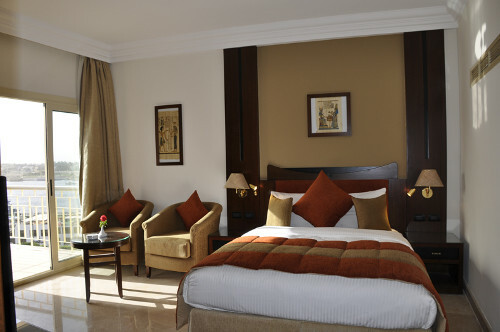 Upon arrival our staff will meet you at the airport and transfer you to your hotel in Amman for the start of your trip. They'll help settle in and introduce you to the local area. The rest of your day is free. If you arrive early in the morning, then a half-day city tour of Amman is available this afternoon. We start our Jordan tour today with a city tour of Amman. We'll make our way to the Citadel - the former home of the ancient Temple of Hercules, The Umayyad Palace, the Byzantine Church before we make our way to the 6000-seater Roman theatre, which was built during the Roman Period. The ancient theatre is still in use today, playing host to numerous cultural events. Afterwards, we drive north for a visit of Jerash, one of the largest and best preserved Roman sites outside of Italy. It is a excellent example of Roman architecture including paved and colonnaded streets, hilltop temples, amphitheatres, spacious public squares and plazas, bathhouses, fountains and a city wall pierced by towers and gates. We depart Amman for a scenic drive along the King's Highway to Petra, crossing deep Wadis, including the majestic Wadi al-Mujib, olive groves, and driving through remote rural villages. En-route we see the Roman mosaics at the Greek Orthodox Church of St. George in Madaba, enjoy great views of Israel from Mt. Nebo, and visit Kerak Castle, one in a chain of Crusader fortresses built across Jordan in the 12th Century. We enjoy a full day today inside the world famous site of Petra, with a 2-3 hour guided tour of this fascinating city. Carved into the rocks and left undiscovered for centuries Petra has always been an enduring attraction for explorers. We start by walking through the Siq and one of Petra's most impressive monuments, the Khazneh (Treasury) comes into view. Our guide will explain the elaborate facades carved into the rock from the top down. From the Khazneh the valley opens out and we'll see the ruined Roman amphitheatre, and colonnaded street. During your free time you can explore for yourselves and walk up a steep and narrow winding gorge past beautifully coloured sandstone cliff walls to the huge and imposing 'Monastery'. The biggest of Petra's carved monuments. Another climb can take you to the High Place of Sacrifice, and Lion Fountain. All in all, this is a full & tiring, but hugely rewarding day touring one of the world's most famous ancient sites. Later today, we leave Petra and drive into the spectacular desert scenery of Wadi Rum where friendly Bedouin hosts are ready to greet us at a comfortable camp beneath the towering rocks and cliffs. We spend the evening and night relaxing at the camp, watching the stars and enjoying a delicious traditional Jordanian meal. We start the day exploring the beautiful desert and mountain scenery of Wadi Rum. We'll take a jeep safari through the beautiful desert scenery, seeing more of the sheer cliffs and bizarre rock formations..
We say goodbye to Wadi Rum later today and head north towards the Dead Sea. The Dead Sea is fed by numerous rivers, including the River Jordan. Once the waters reach the Dead Sea they are land-locked and have nowhere to go, so they evaporate, leaving behind a dense, rich, cocktail of salts and minerals. Although sparsely populated and serenely quiet now, the area is believed to have been home to five Biblical cities: Sodom, Gomorrah, Adman, Zebouin and Zoar (Bela). We'll stop along the way to enjoy a 'swim', though the intensely salty waters lead to a very strange swimming experience. In fact, normal swimming is not possible, and it is easier (and more photogenic!) just to float, sitting or lying in the water. We finish the day back at our hotel in Amman. 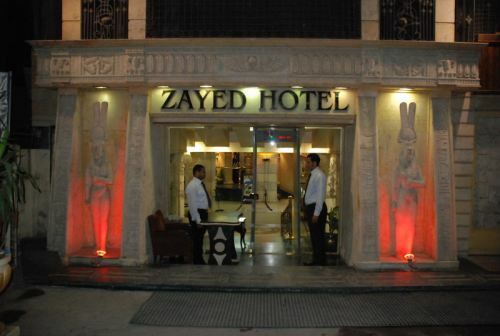 Upon arrival in Cairo airport our staff will meet you and transfer you to your hotel close to the Pyramids for the start of your Egypt trip. They will help you settle in, introduce you to the local area, and explain tomorrow's arrangements. If you arrive early you may like to take an evening dinner cruise on the Nile, or enjoy a spectacular sound and light show at the pyramids (both available to book locally on arrival). Our tour of Egypt begins begins with a visit to the sprawling Egyptian Museum in central Cairo. The museum is home to the famous Tutankhamun exhibit and a huge number of other ancient Egyptian artefacts. One of our experienced local Egyptologist guides will be with you on this tour, and all of your other sightseeing tours. You'll discover our amazing guides have a wealth of knowledge and full are of enthusiasm about Egyptian history, and their country in general. After the museum we then head out to Giza on the edge of Cairo to visit the enigmatic Sphinx and the three greatest pyramids in Egypt, the Great Pyramid of Khufu (Cheops) along with the smaller pyramids of Khafre (Chephern) and Menkaure (Mycerinus), the inspiring sight of these huge structures looming out of the desert is an unforgettable site. You will have a chance to climb inside the pyramids if you wish, but you're on your own, as your guide cannot accompany you (a limited number of tickets are available for the Great Pyramid). In the evening we leave Cairo by coach and head south through the Nile Valley to Aswan. 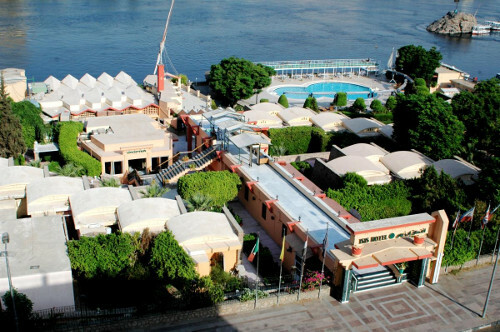 This morning we arrive in Aswan and transfer to our hotel overlooking the Nile which is at its most picturesque here, with cascading rapids, lush green islands, and feluccas sailing to and fro. Aswan itself is a melting pot of African and Middle Eastern cultures, most easily experienced by wandering through the busy markets. Many descendants of the Nubian people still live here and we'll visit a local Nubian village to see their colourful houses, simple way of life and to enjoy a traditional lunch. Our tour in Aswan starts this afternoon with a visit the Temple of Philae, a beautiful island complex dedicated to Isis and reclaimed from the rising waters of Lake Nasser, which we reach by a scenic boat ride. The rest of the day is free. This morning we have the option of taking an early start for the drive to the UNESCO world heritage site at Abu Simbel. These amazing temples built by Ramses II are one of Egypt's main highlights and attractions. Those not visiting Abu Simbel can explore Aswan's markets this morning, walk up and down the Corniche on the banks of the river or visit the Nubian Museum which has a fascinating collection covering the development of the Nubian people in the region. 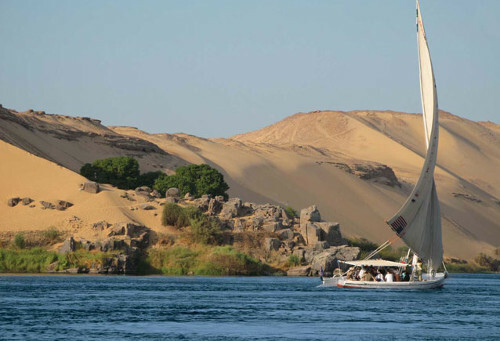 We board our traditional Nile felucca to enjoy an afternoon sailing down the Nile. 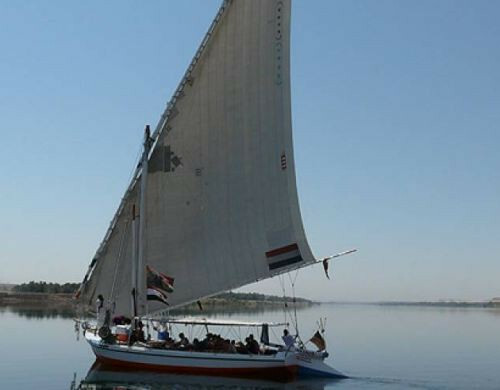 Floating down the Nile on a felucca is one of Egypt's most enjoyable activities and you'll be able to watch local rural Egyptian life pass you by on the banks of the river as you drift past. 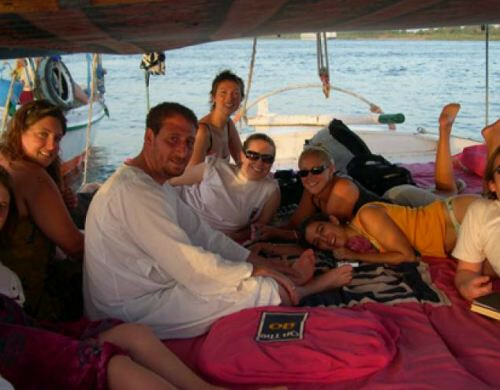 Our Nubian crew will sail the boat and entertain you on the way, as well as preparing meals for you. Our separate facilities boat will join with us from time to time during the day and moor up with us at night. 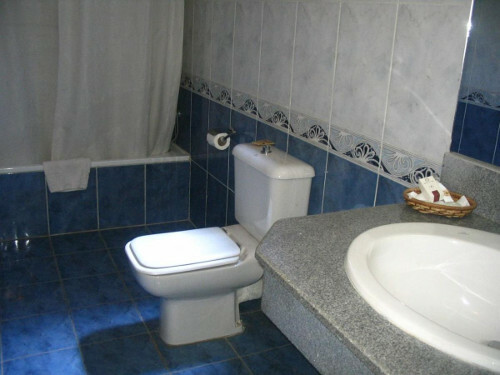 This boat has a welcome toilet and showers on board as well as a hygienic kitchen where the crew will prepare a delicious evening meal. You sleep on the deck of the boat tonight (mattresses, blankets and mosquito nets provided). You have the whole day today to relax and watch the world go by from the deck of the felucca. We'll stop at several islands and on the banks of the river for breaks and to walk to local villages. Meals are prepared by our Nubian crew and drinks are available on board. After breakfast on-board we bid farewell to our felucca crew and drive north to Luxor. The town of Luxor is built on and around the ancient site of Thebes, and boasts the largest concentration of ancient ruins in the Nile Valley, if not the world. To the west of the Nile lies the City of the Dead, with its mortuary temples and rock-hewn tombs, whilst to the east lie the Temples of Luxor and Karnak. Our tour this afternoon is to the huge Karnak complex with our Egyptologist guide. Later this evening he'll talk you on a walking tour of the smaller Luxor Temple which is right in the middle of town and beautifully lit up at night. You'll also stop at some of Luxor's popular outdoor cafes, perhaps enjoying a few games of backgammon and trying a shisha pipe with the locals. Your morning is free today and you can enjoy a welcome lie in after several early starts. Several optional tours are available today, including one to explore Luxor's West Bank. Home to the Valley of the Kings, the dusty tombs in this ancient burial site are still revealing their secrets today and so it remains one of the most important archaeological sites in the world. Our tour includes several of these Pharaonic tombs, as well as the temples of Queen Hatchepsut, the huge Colossi of Memnon, and the Worker's Village. In the evening we board the coach again for the journey back north to Cairo. We arrive back into Cairo early this morning and transfer to our hotel. Most of the day is then free to explore Cairo as you choose or you may take an optional tour. In the late afternoon we take a guided walk through the back streets and bazaars in central Cairo. We'll walk through the huge Bab al-Futuh gateway and explore streets dedicated to metalwork, spices, pottery, fabric, jewelery and anything else you can imagine as we gradually enter the more touristy Khan-el-Khalili bazaar. We'll have time for a break to try some tea and a shisha pipe and perhaps enjoy an early dinner of Egypt's unofficial national dish, Kushari. Finally we visit the evening Al Guri Sufi show at the Wikalat al Ghuri, a 16th centry market place with a domed roof and some beautiful Islamic architecture. A colourful and flamboyant show packs crowds of locals, and some tourists in here twice a week with displays of dervish inspired dance, Sufi vocals and vibrant percussion. This makes a thrilling and entertaining end to our time in Egypt. During peak periods, when queues and waits to get in can be very long, we may have to arrange an evening event at a hotel or restaurant instead of attending this show. Your time is free today for some last minute sightseeing or shopping until we transfer you to the airport for your departure flight. 2. 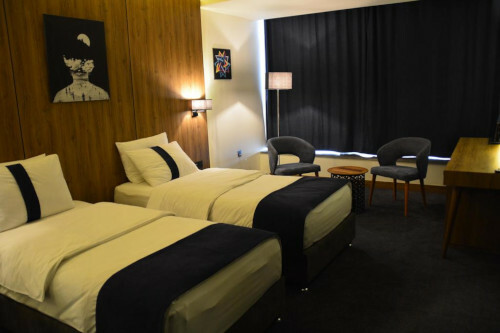 Child Discount : Age 8 - 11 sharing room with 2 full paying adults pays 25% and child will have a fold up bed. 3. 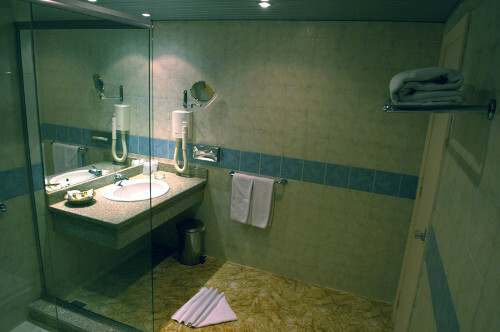 Single travellers are obliged to pay Single Supplement and will have the hotel room to themselves. 4. Hotel Gala Dinners - Many of Egypt and Jordan's hotels and Nile cruise boats arrange a very special gala dinner with entertainment in the evening on Christmas Eve and New Year's Eve. Payment for these is often optional on Christmas Eve (24 Dec) but may be compulsory on New Year's Eve (31 Dec), whether you attend or not. 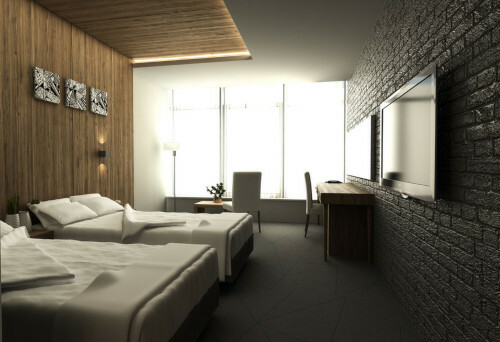 Prices can range from around US$50 to over US$150 per person. Final decisions on prices and whether dinners are compulsory are made relatively close to the time. We aim to always select hotels that make their Gala Dinners optional, though this is is not always possible. Gala dinner prices are therefore not included in our tour prices, but will be added to your booking if they become required. More information is available on request. 5. 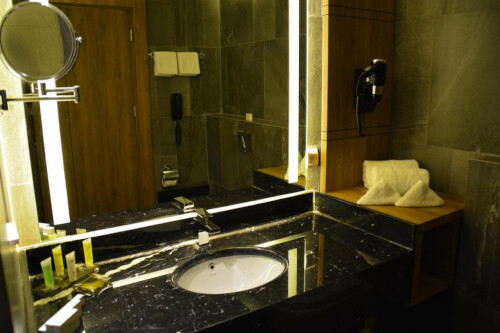 Wadi Rum Desert Camp has hared bathroom & toilet facilities. Upgrades to en-suite tents available and dependent on availabilty. 42 Abu El Mahasn El Shazly Sq.